Somewhere in a forest nearby, a lone guerrilla commander has been waiting for you. As long as you brought your own gun. If you didn’t, you’re clearly a liability. But maybe you can prove yourself during a game of Pass the Sponge. At the very least, you can help grind the sulfur. Meanwhile, the Giant Ibis was thought to be extinct in Cambodia, though footage shot a few years ago reveals that some still exist. That part of the story is true. Basically. But can you really believe a man who was brought up in the taxidermy trade? Join our hero, who actually is maybe a traitor, for the war we were born to fight. 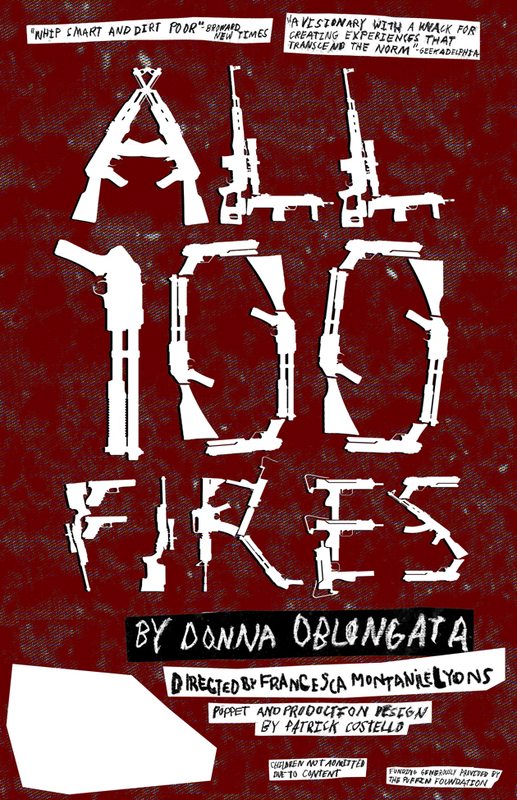 Philadelphia artist Donna Oblongata is touring with a new solo show, All 100 Fires, which stars a guerrilla commander and you, the new recruits. All 100 Fires stars a guerrilla commander and you, the new recruits. Birds flutter in and out, though they mostly dead. It’s a funny play if you like being told that your best isn’t good enough. It’s a sad play if you were hoping something more optimistic would happen. At least you’ll learn how to make explosives.